To learn (or review) information about the lobes of the brain and what they do. These lobes are: frontal, temporal, occipital, parietal, sensory cortex and motor cortex. 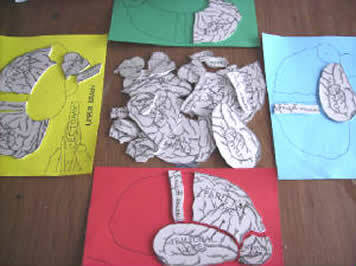 Each player tries to fill the brain outline with the appropriate lobe parts. Players win parts by answering multiple choice questions. This makes a great review activity if you have just been studying the brain, but it can also be played without a lot of study ahead of time because the answers are multiple choice and you can learn as you go along. This game is used as a review activity in “The Brain” curriculum. The student text covers all the information needed for the game.